Today I was looking at my clown painting and suddenly, it jarred my memory. It doesn't take much jarring these days to take a trip down Memory Lane or whatever that street's called. 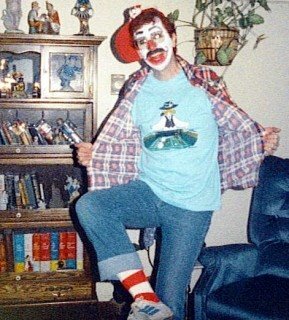 I don't like to lay the blame on anyone, but since she's deceased, I'll point my finger at Sylvia as the culprit that got me going on my clown collection and my interest in clowns.. It all started several years before when the lady in question and I were just friends. We were able to become 'best friends' so quickly because both of us had made the promise that we would NEVER get married again after what we'd been through.